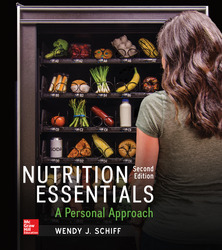 Nutrition Essentials: A Personal Approach is the nutrition book that is all about YOU! The personalized, consumer focus gives plenty of practical examples to help students learn about choosing foods and making decisions that are good for their health. Nutrition is more than vegetables. Find out how we’re making it PERSONAL! Module 1.1 Why Learn about Nutrition? Unit 2 Nutrition Information: Fact or Fiction? Module 3.4 Should I Take Dietary Supplements? Module 5.2 What Happens to the Carbohydrates You Eat? Module 6.1: What Are Lipids? Module 6.2: What Happens to the Fat and Cholesterol You Eat? Module 7.1 What Are Proteins? Module 7.2 What Happens to the Protein You Eat? Module 9.4: Alcohol: Drink to Your Health? Module 10.1 Overweight or Obese? Module 10.5 Get Moving; Get Healthy! Module 11.2 How Safe Is My Food?